Make the most of small garden spaces and containers. If this is you’re first time planting bulbs, this project is super-easy to do, and it’s often called “Spring Bulb Layering.” Florissa’s draw this week features bulbs that can be planted up in containers in layers. Please continue to read on for the how-to step by step using the gorgeous varieties featured in our giveaway. Remember now is the time to sign up for our draw! Enter here and across all of our social media platforms for the best to chance to win an outstanding collection of spring flowering bulbs! Start by choosing a large container for planting in layers. Plastic pots are reasonably priced and available in many different styles and sizes. They won’t crack, and they do offer some protection against cold and wind. 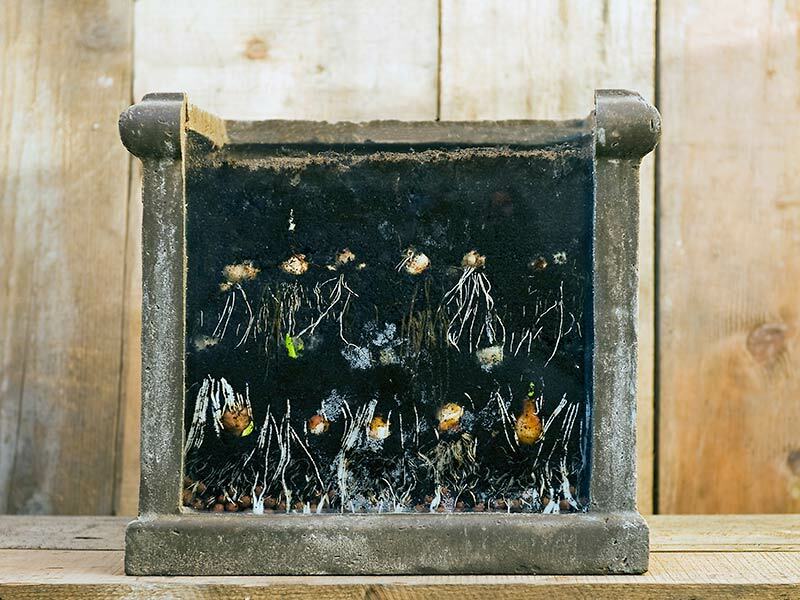 Choose a pot at least 50-60 cm (20-24”) deep with good drainage holes in the bottom. The pot’s diameter should be 45-60 cm (18-24”) across. 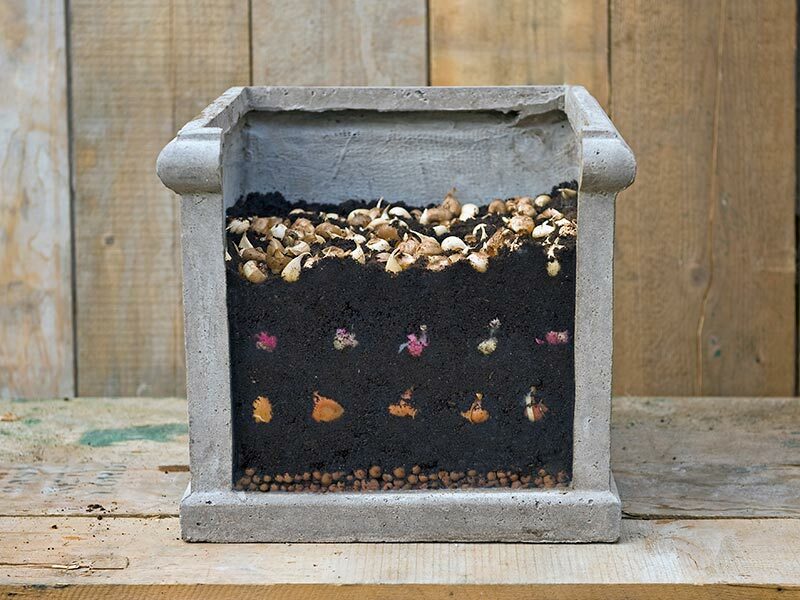 Bulbs grow best in well-draining soils, so begin by placing a layer of small rocks or pebbles in the bottom inch of the container. Top off the small rock layer with 15-20 cm (10”) inches of a moist soil mixture. Any container or hanging basket soil mixture will work well for this project. In this recipe, we’ll begin with our Colourful Companions ‘Under the Stars’ – a showy and spectacular combination of elegant white and boysenberry purple blooms. Florissa’s Colourful Companions take the guesswork out of creating stunning spring flowering combinations that are well-matched in height and blooming times. Tulips go into our container first, because they prefer a planting depth of 15-20 cm (6-8”) in the soil. Arrange them in the centre of your container, spacing them about 10 cm (4”) apart. Plant the bulbs for Allium ‘Purple Sensation’ in the same layer with the tulip bulbs. ‘Purple Sensation’ is one of the earlier blooming alliums, and quick to bloom along with this flowery party. It’s many starry violet flowers gather together into one perfectly rounded sphere. It will draw the pollinators, honeybees and butterflies, and make a splendid long-lasting cut flower. When the bulbs are in place, cover them with another 2-3” layer of your soil mixture. You can sprinkle a little bit of bone meal on top of the soil if you like. Bulbs that are the last to bloom, such as tulips and alliums, are planted in the first layer, since these bulbs often require the greatest soil depth. In the middle layer, or next layer up, mid-spring blooming bulbs are planted, like narcissus and hyacinths. Those bulbs that are first to bloom, snowdrops and crocus for example, are planted in the final top layer. The second or middle layer bulbs should be set about 10-15 cm (4-6”) deep in the soil are planted next. Following our recipe, Narcissus White Lion is second up. Introduced in the 1940s, this gorgeous and sweetly fragrant daffodil has long-lasting blooms of creamy white petals surrounding a bright yellow centre. Also plant Hyacinth ‘Woodstock’ on this middle layer. The exceptional and fantastic dark plum colour of ‘Woodstock’ blends well with our Colourful Companions, and it’s sweetly fragrant too. Blooming in early to mid-spring along with the tulips and narcissus, this container will be dense and bursting with flowers. Set the hyacinths in and around the narcissus bulbs, spacing them 15 cm (6”) apart. It is okay if the bulbs are directly above bulbs that are planted below. Tulip and allium stems are strong and will make their way through the soil and around the bulbs above, growing towards the soil surface. Top off this middle layer with another 2-3” inches of soil mixture. For our final and third layer, we’ll plant Snow Crocus ‘Blue Pearl’, with its soft shimmery blue blooms that are creamy white on the inside. 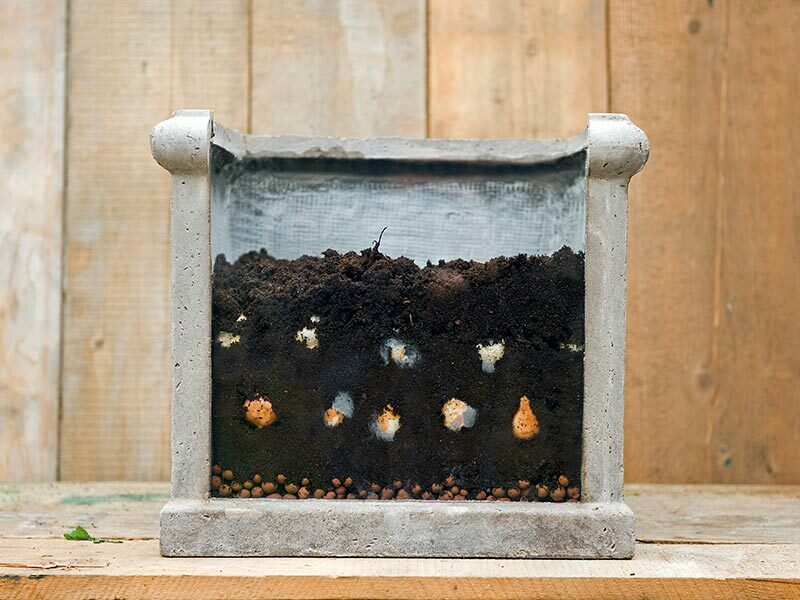 These bulbs require the least amount of depth in the soil. 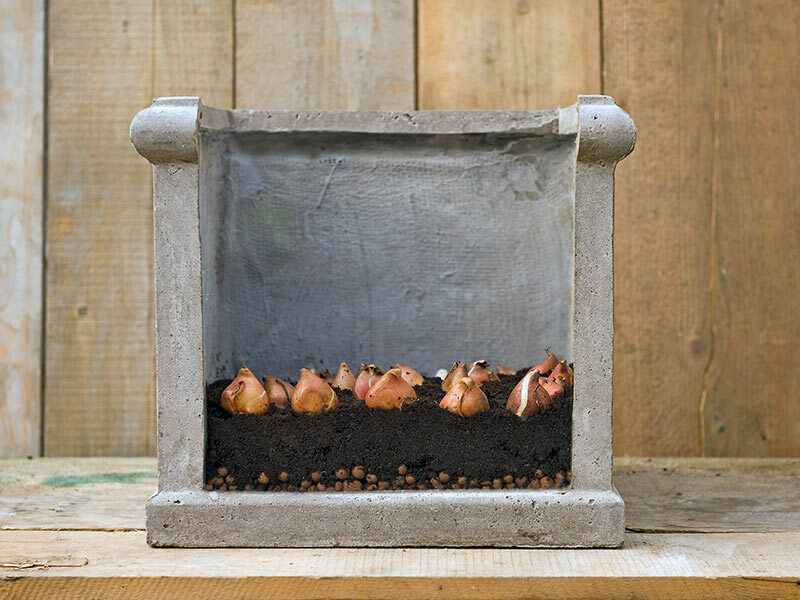 Evenly space these small bulbs over the top layer but avoid placing them within 5 cm (2”) of the outer edge of the pot. Cover these bulbs with a final 2-3” layer of soil and water in well. Around the outer edges of your container, leave 5 cm (2”) of soil space to act as insulation. 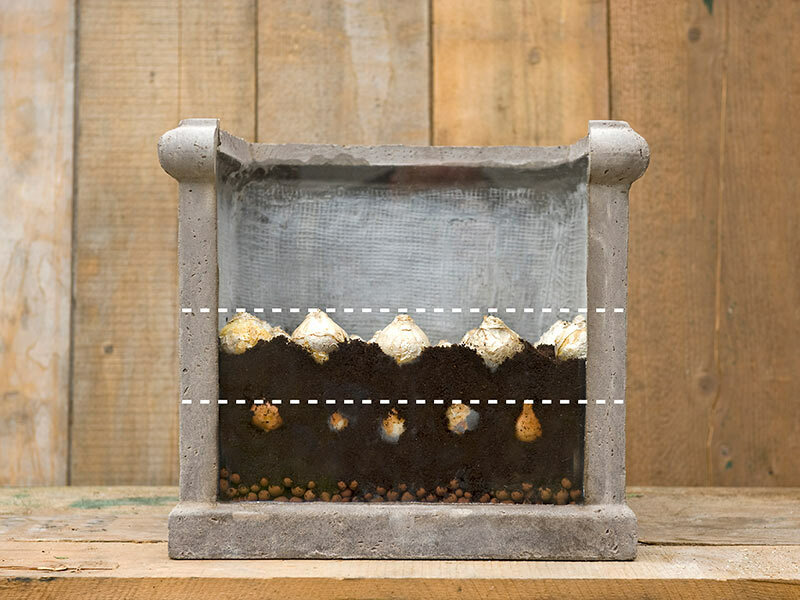 Plant your bulbs inset from that 5 cm (2”) of space. Place your container in a protected spot alongside the house, under a hedge, or in an unheated garage where it is out of the sun and wind. 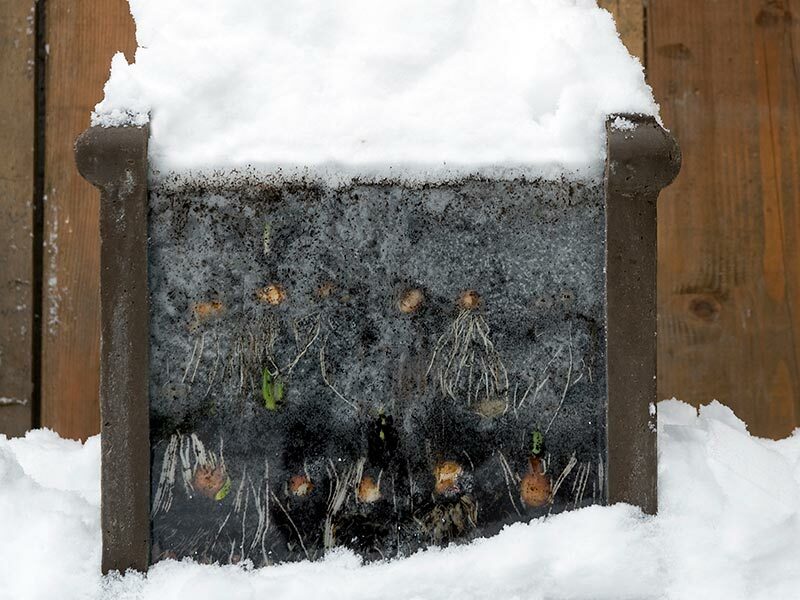 It is okay for rain and snow to be on the containers, it is the cold dry winds that cause problems for potted bulbs. If your container is in the garage, check on it periodically over the winter and water it, as you don’t want the soil to completely dry out. In the spring, when the tips of the bulbs start to poke through the soil, move your container to a warmer location that receives part sun. Now is the time to plant spring flowering bulbs, and we’ve just shown you how easy it is to do! Follow our recipe or come up with your own spring bulb lasagne. The best and most exciting part is watching each flush of spring’s blooms appear!